This article is about Patriology as a discipline in Christian theology. For patriological aspects of various gods and deities in some other religions, see God the Father. For other uses of the term in some social sciences and humanities, see Patriarchy. In Christian theology, term Patriology refers to the study of the God the Father. The word Patriology comes from two Greek words: πατέρας (pateras, father) and λογος (logos, teaching about). As a theological discipline, Patriology is closely connected to Christology (study of Christ as God the Son) and Pneumatology (study of Holy Ghost as God the Spirit). The term Patriology should not be confused with similar term Patrology that involves the study of teachings of the Church Fathers. There are three basic forms of the name of God the Father in the New Testament: Theos (θεός the Greek woed for God), Kyrios (i.e. Lord in Greek) and Pateras (πατέρας i.e. Father in Greek). Also, the Aramaic word "Abba" (אבא), meaning "Father" is used in Mark 14:36 and in Romans 8:15 and Galatians 4:6. The word for Father was chosen to coin the name of the discipline because Patriology involves particular studies of the person of God the Father, and the works of the Father. Different Christian denominations have different theological approaches to various patriological issues, concerning the person and works of God the Father. Christian Patriology is primarily based on the study and interpretation of Bible verses that are referring to God as "Father". In the Old Testament, God is called "Father" mainly in metaforical sense. The God is seen as "Father" to all men because he created the world (and in that sense "fathered" the world). In the Hebrew Scriptures, in Isaiah 63:16 (JP) it reads: "For You are our father, for Abraham did not know us, neither did Israel recognize us; You, O Lord, are our father; our redeemer of old is your name." According to Judaism, God is attributed with fatherly role of protector. He is titled the Father of the poor, of the widows and orphans. He is also titled the Father of the king, as the teacher and helper over the judge of Israel. In the Old Testament term "Father" when used for God is a metaphor. It is not a proper name for God but just one of many titles by which Jews speak of and to God. In Christianity, the concept of God as the Father of Jesus differs from the concept of God as the Creator and Father of all people, as it is indicated in the Apostle's Creed. The profession in the creed begins with expressing belief in the "Father almighty, creator of heaven and earth" and then immediately, but separately, in "Jesus Christ, his only Son, our Lord", thus expressing both senses of fatherhood within the creed. At the end of the first century, Clement of Rome was referring to the Father regarding creation, 1 Clement 19.2 stating: "let us look steadfastly to the Father and Creator of the universe". Around AD 213 in Adversus Praxeas (chapter 3) Tertullian was developing a formal representation of the concept of the Trinity, meaning that God exists as one "substance" but three "Persons": The Father, the Son and the Holy Spirit, and with God the Father being the Head. Tertullian was also discussing the relations of Holy Spirit to the Father and the Son. including the notion of procession "from the Father through the Son". Early creeds in the Western Church were affirming the belief in "God the Father (Almighty)", the primary reference being to "God in his capacity as Father and creator of the universe". This did not exclude the fact that "eternal father of the universe was also the Father of Jesus the Christ" nor that he had even "vouchsafed to adopt [the believer] as his son by grace". Creeds in the Eastern Church began with an affirmation of faith in "one God" and usually expanded this by adding "the Father Almighty, Maker of all things visible and invisible" or similar words to that effect. The Nicene Creed, which dates to 325 and 381, states that the Son (Jesus Christ) is "eternally begotten of the Father", indicating that their divine Father-Son relationship is seen as not tied to an event within time or human history. 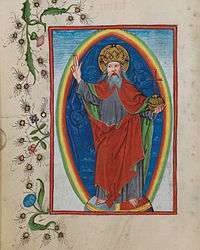 Wikimedia Commons has media related to God the Father. Look up patriology in Wiktionary, the free dictionary. ↑ Mills 1990, p. 2. ↑ Thompson 2000, p. 35. ↑ Tertullian Adversus Praxeas 4 (ANF 3:599–600): "I believe the Spirit to proceed from no other source than from the Father through the Son"
↑ Tertullian Adversus Praxeas 5 (ANF 3:600–601). ↑ O'Collins & Farrugia 2015, p. 157. Mills, Watson E., ed. (1990). Mercer Dictionary of the Bible. Macon: Mercer University Press. Thompson, Marianne Meye (2000). The Promise of the Father: Jesus and God in the New Testament. Louisville: Westminster John Knox Press. O'Collins, Gerald; Farrugia, Mario (2015). Catholicism: The Story of Catholic Christianity (2nd ed.). Oxford: Oxford University Press.